Babaji Hostel is in a great Central location close to the Ao Nang Post Office and many affordable restaurants. It is surrounded by everything you need from 7/11, Family Mart to massage spas and night life/ party places. It's nice and quiet but has a restaurant with a pool table. It has all of the basic facilities with , an auto-lock door, lockers, A/C, fans, hot showers and separate washrooms. It is clean, cheap and quiet. Only a 15 min. walk to the beach. Babaji hostel offers Free Wi-Fi access throughout our whole hostel, 20-hour front desk service where you will be able to easily book tickets for all attractions in the area, airport bus and taxi service, boat tickets, laundry service and motorbike rental all available. 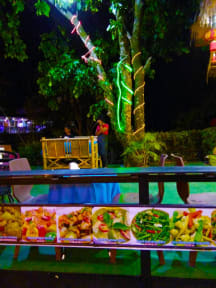 A large chill out area with cocktail bar and pool table for you to socialise and meet with other young backpackers from around the globe. 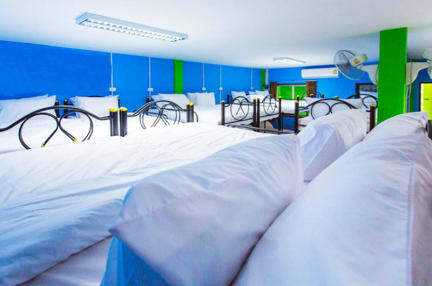 Both dormitory and private rooms are secured with key card access only for everyone's safety, dorms have bunk beds, air conditioning, fan, free lockers and shared bathrooms with hot shower. Our restaurant is open every day from 8:00am - 10:00pm and serves a large selection of Thai and Sea food all at a local price. With friendly staff and central location Babajio Hostel is the perfect place for you to explore the excitement of Krabi, located just a short 10/15 minute stroll from Ao Nang Beach. Also surrounded with a range of services and amenities all within 150m - Post office, Tesco supermarket , ATM and 7 Eleven for all your daily needs. We want you 2 enjoy your stay with us by keeping up a high standard but more importantly staying within the limits of a budget backpacker. 1). Check in from 8am to 11pm. and check out until 12 noon. You get what you pay for, the atmosphere is not so good. Just a bad vibe. You stay with 20 persons in the room, this was a little to much for us but if you are fine with that then it’s ok. The bathroom is very dirty, hairs and insects everywhere (even on the ceiling). This is a sign this doesn’t get cleaned very often. In their description they say it is only 15 min from the beach, but we walked at least 30 minutes to the beach every day.